Bring the Moderne Movement that began in 1920s Paris and Brussels to your studio work table or easel! 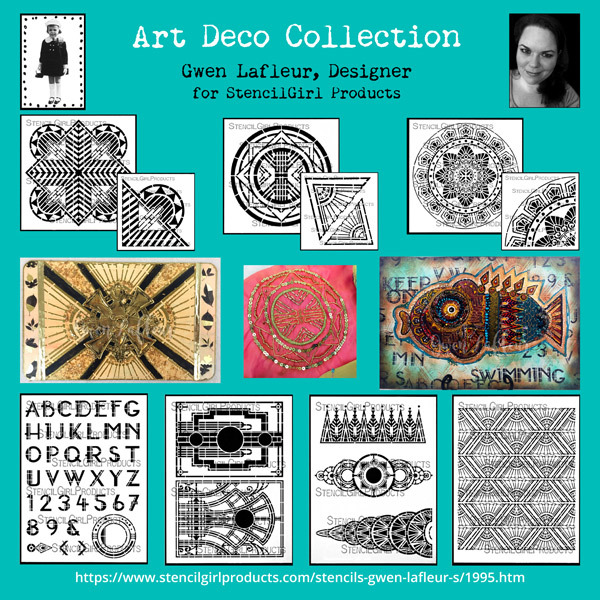 StencilGirl is captivated by the 10 opulent stencils Gwen Lafleur designed for her Art Deco Collection. 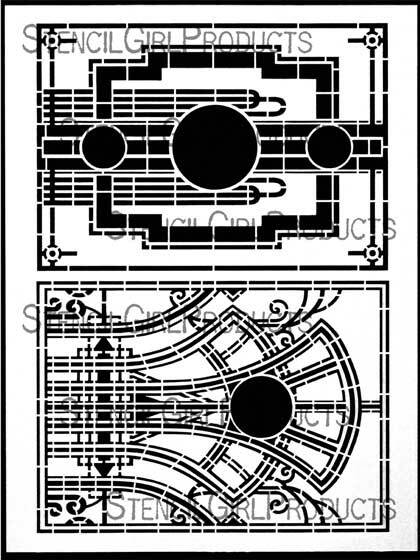 In one of my smaller art journals, I used one of the designs on the Art Deco Bookplates stencil in a more traditional approach - I kept it pretty much as a bookplate! I gesso'd and painted the background, then stenciled over top and embellished. I finished by using my Art Deco Alphabet stencil to add the title. 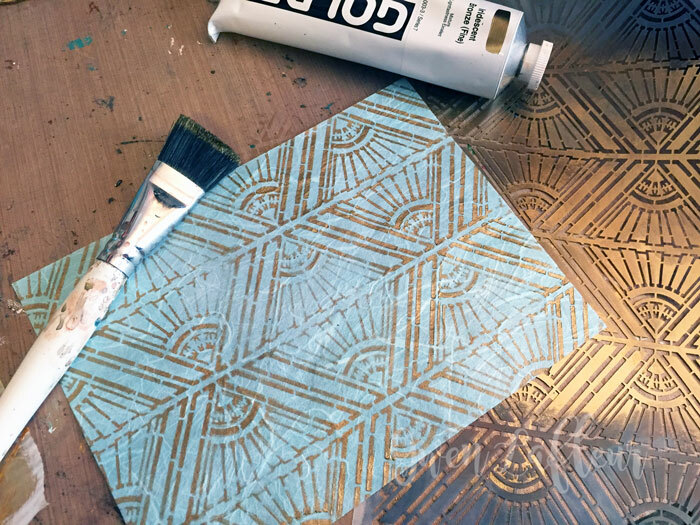 I'm not normally one to share pictures of nothing but stenciled paper, but I loved how this photo from another project really showed off this repeating background. This is a mystery, in-progress shot, from an upcoming blog hop project that will be shared on the 20th. It's just bronze acrylic paint on mulberry paper, but I thought it was so pretty on its own! 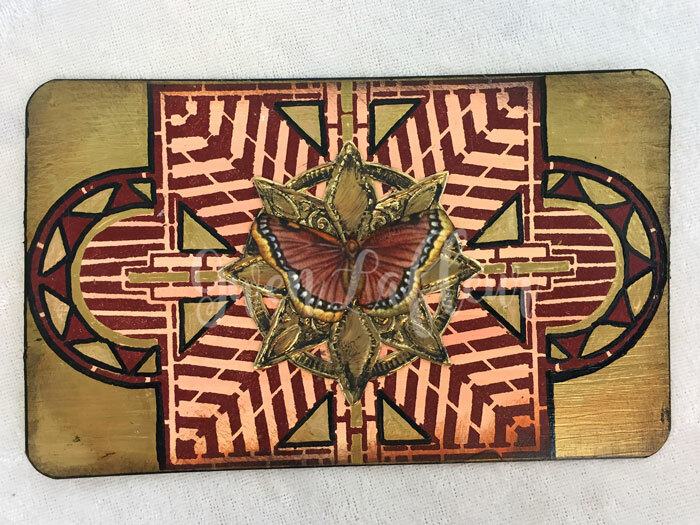 M166 Art Deco Sunburst Corners 4" x4"
S455 Art Deco Sun Medallion 6" x 6"
Layers: Art Deco Sunburst Medallion stencil with another Dresden medallion, paint pens, and a butterfly cut from one of my collage sheets. The cards are about 4"x6". Foundation:10"x20"x1" cradled gesso board panel. 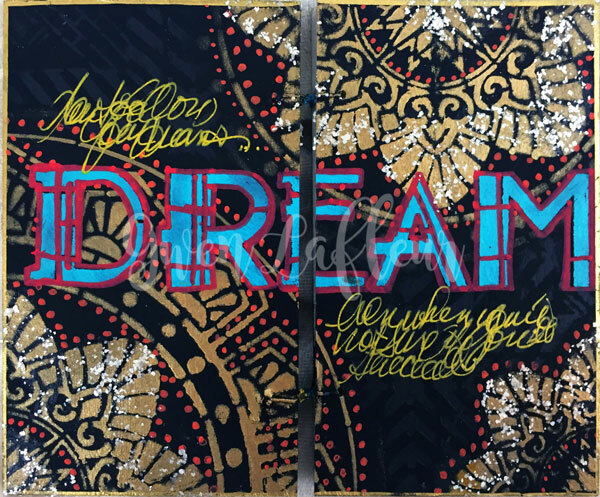 The background was made from stenciled papers collaged onto the panel, followed by layers of paint and more stenciling and finished with touches of Golden Pearl Mica Flake medium. The center section has layers of stenciling done with heat embossing and deli paper. The focal point is a porcelain Peking Opera mask of the god of collecting treasure (which is probably why I was so drawn to him.) 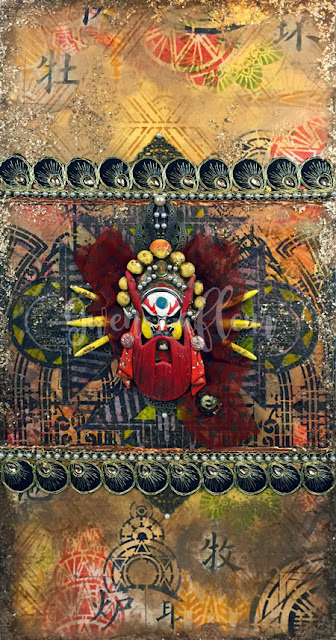 He was glazed and accented with an upcycled sari scrap, stone spike beads, and metal findings with faux pearls. Art Deco Flower Medallion (harder to see, but it's there in the background - green stenciling). The gold embroidery just uses the Art Deco Medallion stencil, and it was done on a scrap of iridescent silk from an upcycled sari. I'm planning to mix this with some other trims and fabric scraps to make an iPad cover/pouch. 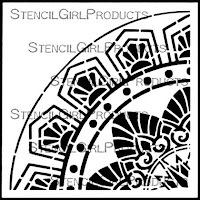 I started with the Art Deco Flower Medallion, Art Deco Flower Medallion Repeating Corner stencils and molding paste on the plain Davey board from my handmade art journal (it's 11"x11"). 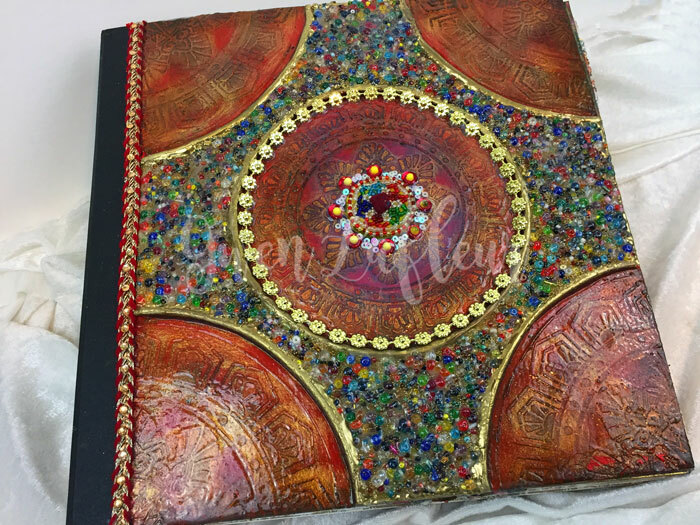 I outlined each section with ropes of paper clay then filled the area around the stenciling with seed beads and flooded it with clear gel and let it dry. 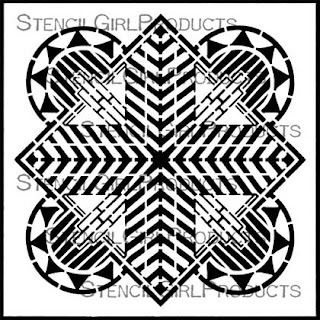 I added color and embellishment to the stenciled areas and then used a different clear gel to coat those. I've been waiting to decorate the cover of this journal until I had just the right thing to put on it, and this was perfect - I love it! 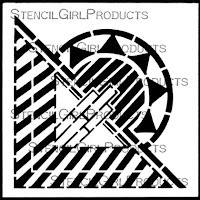 M164 Art Deco Flower Corner stencil 4" x 4"
My Peacock Art Journal Spread uses the Sun Medallion Repeating Corner stencil for a spread in one of my smaller art journals (6"x8" journal.) 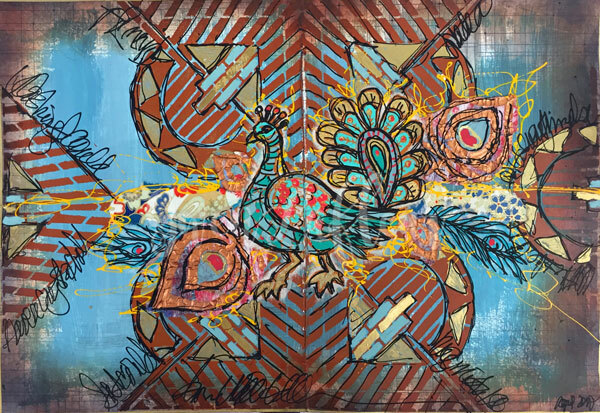 Collaged images on top of stenciling with paint on a painted background. 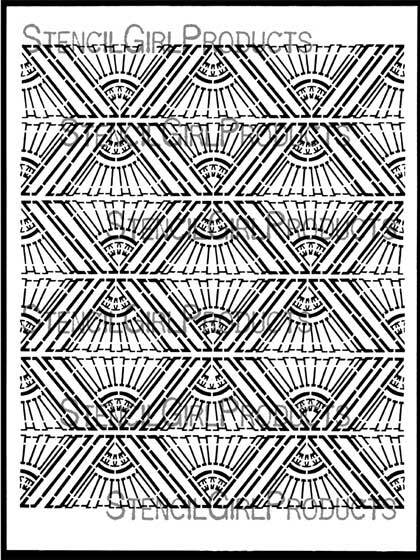 M165 Art Deco Sun Medallion Repeating Corner 4" x4"
This one is mixed media collage on a piece of 11"x17" Bristol paper. I was going to do a concentric circle or square collage, but started looking at the shapes I wanted to use and realized that I could make a really cool fish if I changed the way I combined the images. 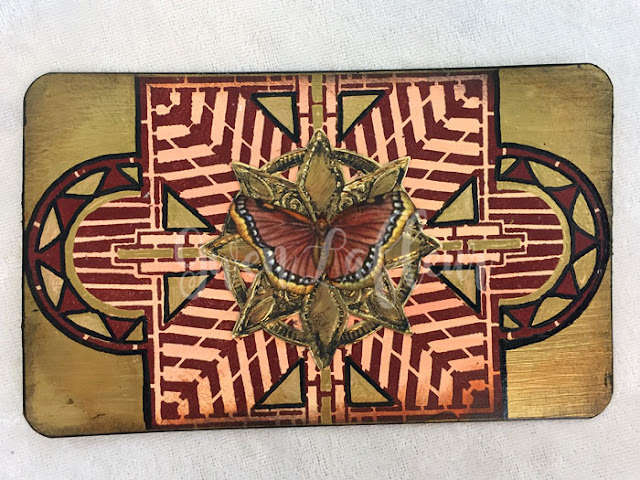 I stenciled the different Art Deco designs on pieces of scrap deli paper that were covered with paint and other marks from cleaning my stencils and brushes, then tore or cut them out and started assembling. 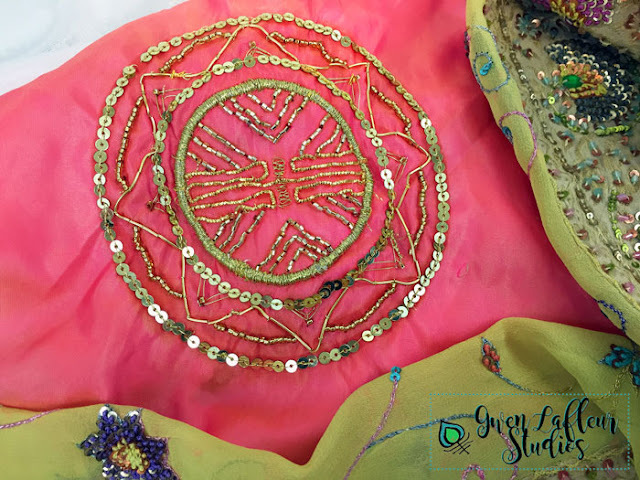 The space between the center and the tail is a piece of upcycled sari fabric, and there's a silk jacquard sari ribbon in the middle. 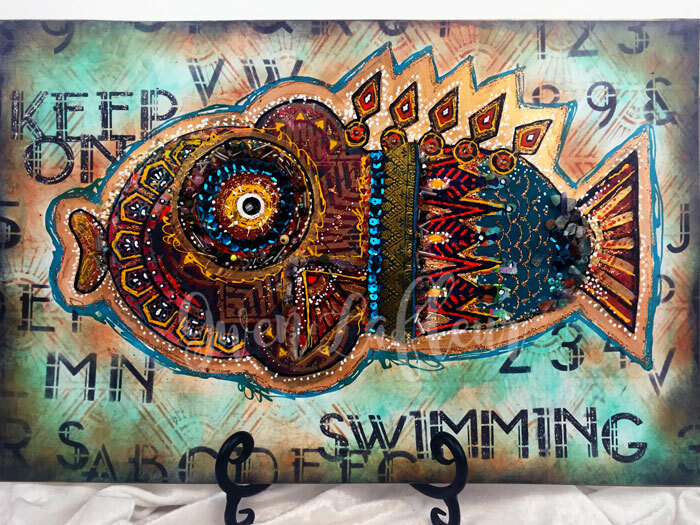 The "lips" were cut from scrap paper, but all of the other images that make up the fish are stenciled. 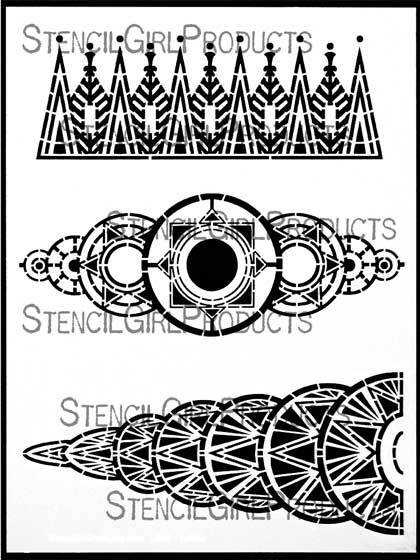 The eyeball is actually built up off of the circle frame on the Art Deco Alphabet stencil, and the spikes along its back are embellishments from that same stencil. The collaged image was accented with paint, glitter glue, beads, and sequins - it has quite a bit of texture! The background was stenciled with Archival ink, then painted with different shades of turquoise glazes, and then I added more word and letter stenciling with ink, and inked the edges. This is another spread in my handmade 3"x5" journal (spread is 5" tall by 6" wide.) 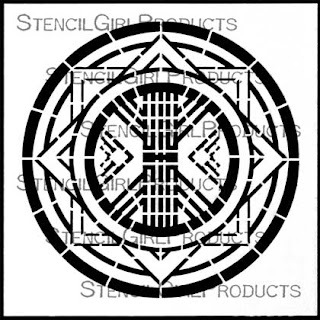 I used the Art Deco Flower Medallion and Art Deco Flower Medallion Repeating Corner then did some tone on tone stenciling in the background with the Art Deco Sun Medallion and added a title with the Alphabet stencil. 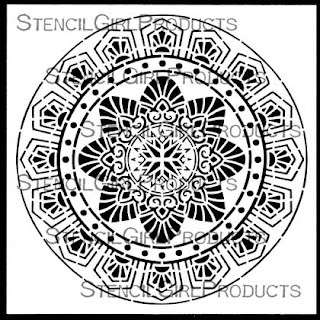 S453 Art Deco Flower Medallion 6" x 6"
Now aren't you ready to fashion your own opulent art projects? 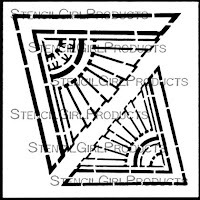 Watch for the April 12th edition of the Scoop for even more art with these stencils! 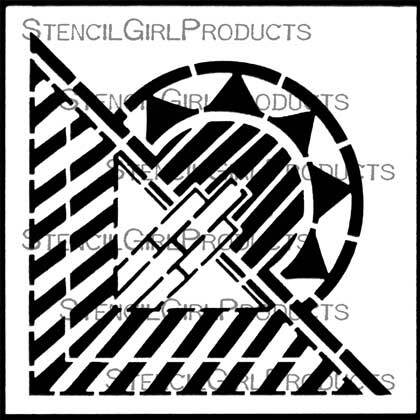 You can find all of Gwen's new stencils HERE. Absolutely awesome collection Gwen!!! I need them all!! These are fabulous Gwen! Wow! Wonderful art deco inspired collection! Gwen this is such an incredibly luscious collection that I can't wait to get my hands on. And the projects that you made to compliment them are extraordinary! You have been busy girl! lol, busy for sure :D Thanks so much Jill! Ummmmm I NEED every single one of this collection! Breathtaking! 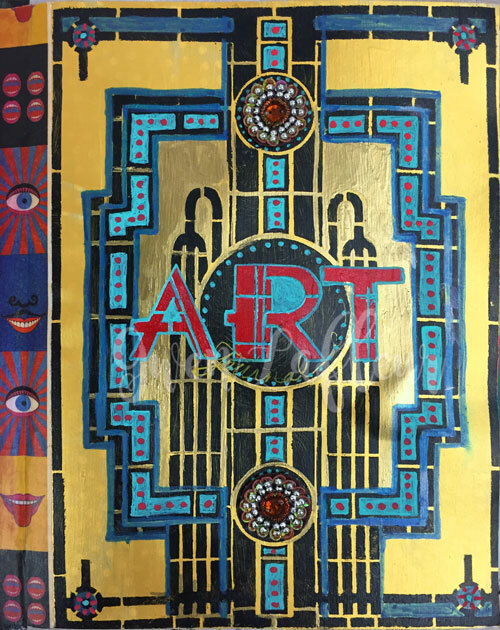 I love art deco and these are amazing.My wishlist is overflowing! Wow, stunning work with these intricately designed stencils. You're amazing, Gwen! ooooooooooooh Gwen, you did it again! Love the designs and the letters! wow, oh wow! Thanks Sandee! I'm pretty excited about the alphabet - my first one! Well these are fabulous!!! Can't wait to try them. Thanks Sara! Can't wait to see what you do with them! I am in love with your designs & work......My true love is making books......and your designs have inspired many a book cover ! 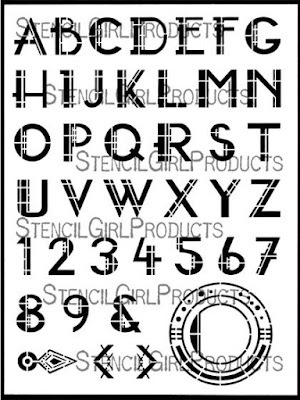 I especially loved the idea of stenciling over mulberry papers...genius !! But mostly thank you for SHARING so many wonderful tips/ideas.....such a gift to others. Aw, thank you Joan! So happy to hear how much you like them :) And yes, try mulberry paper - it worked great! Wow Gwen this art is really amazing, thanks for sharing this great thing.